Should the Giants pick Dwayne Haskins or Kyler Murray in the NFL Draft? A Giant Decision: Dwayne Haskins or Kyler Murray? Regardless of what HC Pat Shurmur says, the Giants need to move on from Eli Manning. Not only have the fans soured on him, but he is also squandering the prime years of arguably the best young supporting cast in the NFL. While the offensive line can shoulder some of the blame for Manning’s faults, evidenced by a No. 27 ranked Protection Rate, his inability to play to his teammates’ strengths is the downfall of the offense. The Giants have the chance to salvage their future with a QB from the 2019 NFL Draft. Manning’s air yards per attempt is a prime example of his inability to utilize his teammates’ skillsets. The Giants lacked explosive downfield passes all season despite having the fastest group of skill players in the NFL. Manning’s 3.7 air yards per attempt and 35.1-percent deep ball completion percentage were both bottom half among QBs. They even turned to Odell Beckham to make some deep throws, as he went 2 for 2 for 57 and 49-yard touchdown passes in 2018. Beckham is one of the top receivers in the league and needs a passer that can capitalize on his route running and deep ball capabilities. The Giants lucked out and find themselves as the only team in need of a quarterback in the top-6 of the 2019 NFL Draft. 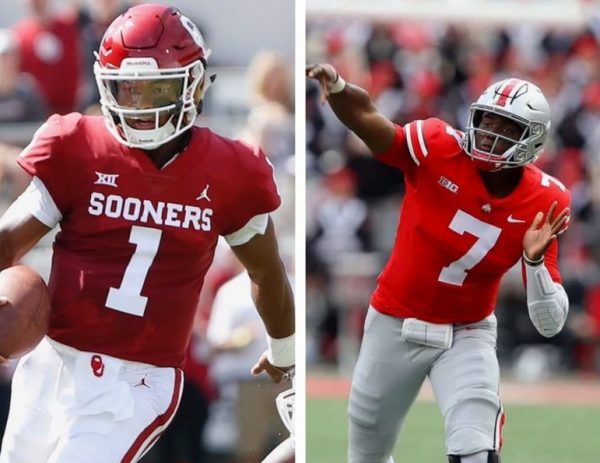 Unless they find another “generation” running back in this year’s draft class, their decision will likely come down to Ohio State QB Dwayne Haskins or Oklahoma QB Kyler Murray. Giants GM Dave Gettleman has never been in a situation where he had to draft a QB, so this is uncharted territory. As a GM, the only QB he ever drafted was Kyle Lauletta in 2018, who threw two interceptable passes on his five attempts last season. The obvious (and safe) answer is that he will want a quarterback to fit Pat Shurmur’s offense. This would make Dwayne Haskins the guy, as he stands 6-3 220-pounds. and looks the part of a traditional pocket passer. He dominated from the pocket on Ohio State’s quick-hitting offense, as he threw for 50 touchdowns and nearly 5000 yards while only rushing for 108 yards in his only season as a starter. If Haskins somehow posts impressive athletic scores at the Combine, he managed to hide them on tape all season. He looks like an “Eli Manning pocket-statue” clone that would excel in a West Coast offense predicated on quick passes. If the Giants wanted to leverage sound logic and analytics to make the correct choice, they would target Kyler Murray. In the wake of Baker Mayfield’s Heisman-winning college dominance, Murray replicated him in spectacular fashion. He actually bested Mayfield’s 11.5 (99th-percentile) college yards per attempt with a staggering 11.6. Murray also flashed his rushing upside all season, finishing with 1001 yards and 12 TDs on the ground. He did fall just shy of Mayfield’s completion percentage, TD passes, and interceptions, but still did enough to win a Heisman of his own. The only real knock on Murray is his size. Murray stands below 6-foot and around 200-pounds. The easiest comparison to make is to Russell Wilson, but it truly isn’t far fetched. Murray flashed the pocket presence and poise to slide away from defenders and make throws when pressured. The ability to evade and create is exactly what Wilson does to overcome his offensive line deficiencies in Seattle. The Giants are in need of the same thing, and Murray’s athleticism will give them that chance. Players like Wilson and Murray offer infinitely more upside than a traditional QB like Manning, who falls down whenever a defender has a free look at him. Case Keenum excelled at escapability during his time in Minnesota with Pat Shurmur, giving Adam Thielen and Stefon Diggs the necessary time to execute double moves and create explosive plays. The Giants could make the decision to trade down, acquire future assets, and tank for Tua Tagovailoa or Trevor Lawrence in 2020, but Gettleman has never traded down during his tenure as a GM. Careers turn over quickly in the NFL. 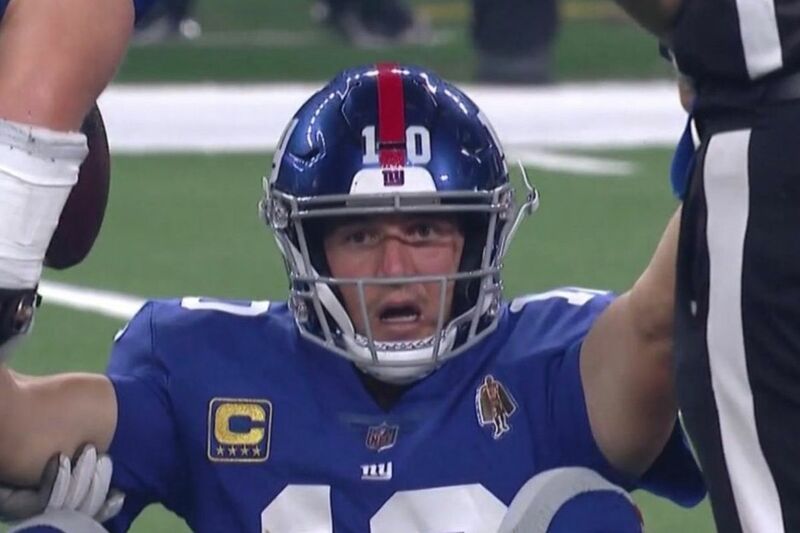 The Giants need to win now while Beckham, Evan Engram, Sterling Shepherd, and Saquon Barkley are still in their prime, and hitting on a rookie QB is the only way. That QB should be Kyler Murray.